This Johnson Self-Leveling Cross-Line Laser projects three vertical lines and one horizontal line simultaneously or individually. The laser can be rotated 360 degrees and can be set to pulse for use with the optional line detector. It features a locking mechanism to protect the inner pendulum during transportation. 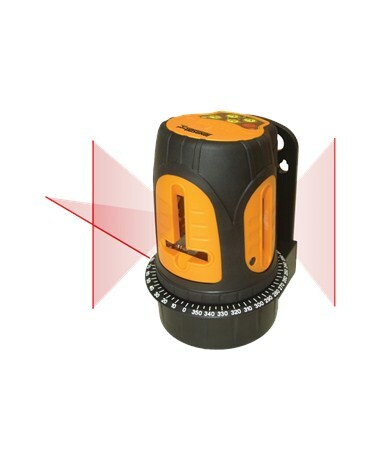 This laser has an accuracy of ±3/16 inches at 50 feet and self-leveling range of ±3 degrees. With its manual mode, it allows this Johnson Self-Leveling Cross-Line Laser to tilt to extreme angles for accurate measurements. It also comes with visual and audible alarms that indicate when it’s beyond leveling range. It has an interior range of up to 200 feet that makes it ideal for indoor applications such as drywall installation, drop ceilings, wallpaper, stenciling/painting, tiling walls and floors and much more. For exterior applications such as landscaping-terracing, site preparation, controlling concrete pours it has a range of up to 300 feet with a detector. 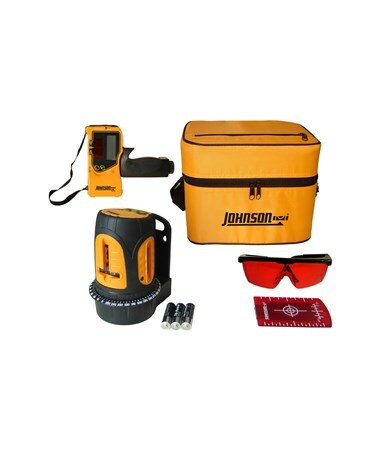 This Johnson Self-Leveling Cross-Line Laser comes with an IP class protection of 54 that makes it dust and water proof. This laser includes 3 "AA" alkaline batteries, tinted glasses, magnetic target, instruction manual with warranty card, and soft-sided carrying case. It also comes with a 3-year warranty. 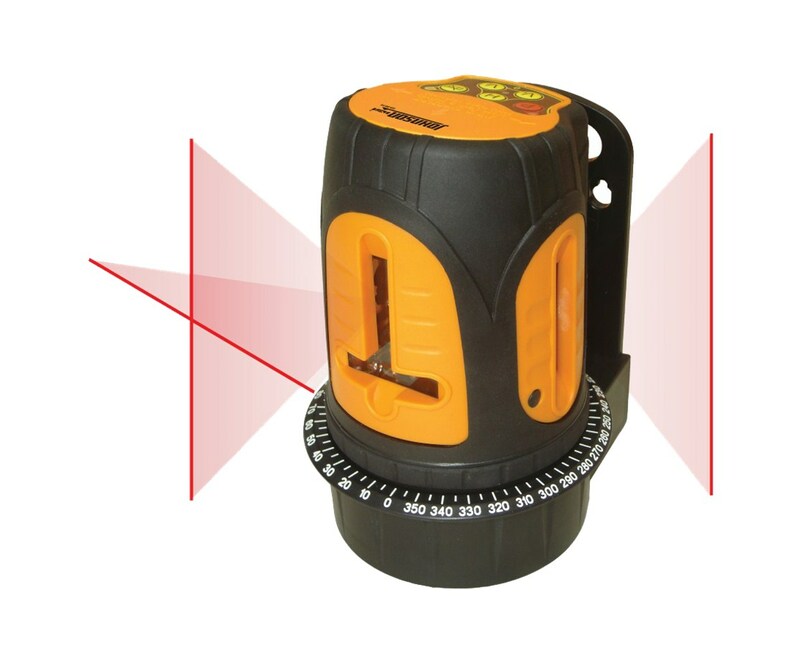 TheJohnson Self-Leveling Cross-Line Laser with 3 Vertical Lines is available in different packages. Select your preference from the drop-down menu above. This package includes a Laser, 3 "AA" alkaline batteries, tinted glasses, magnetic target, instruction manual with warranty card and soft-sided carrying case. 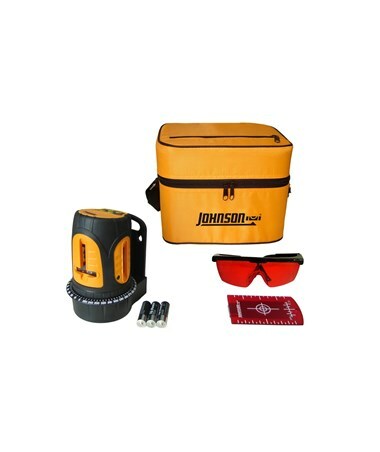 This package includes Laser, line generator laser detector with clamp, 3 "AA" alkaline batteries, tinted glasses, magnetic target, instruction manual with warranty card and a soft-sided carrying case.